Digital recording systems, especially those that use large video monitors, enable you to edit your music visually. This can be a great asset when you want to edit sounds down to the waveform level or if you don’t want to hassle with aural searching. In visual editing, you choose your edit points by viewing the audio waveform of a track on-screen. 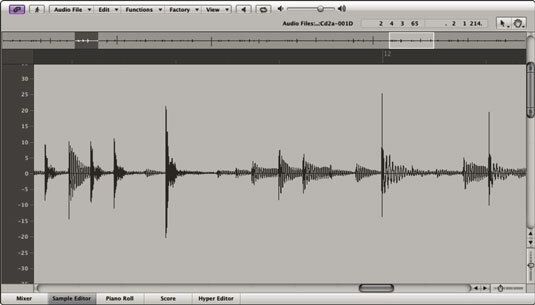 The audio waveform shows the amplitude (volume) of the sound that’s recorded to disk. The waveform editor lets you see the music, making editing pretty easy. You can use the waveform as a guide to show you where a particular sound is located. For example, if you pull up the waveform of a drum rhythm and set the track to play, you can see where the various sounds of the drum set (snare drum, kick drum, and so on) are located. Then just put a marker on the fly or stop the playback roughly where you want to be. As you get used to hearing the music and seeing the waveform pass by on your computer screen, you’ll be able to tell by looking at a waveform where a sound starts and stops. Click and drag to create a box around the section you want to edit. This is generally the easiest way to choose a section of audio. Choose the numerical location points. On SIAB systems, which typically don’t have a cursor or mouse to work with, you can do this quickly by finding the point in the waveform and clicking a button (called the Now button in the Roland SIAB systems). The data is entered into the box, and you don’t have to type the numbers. Type the beginning and ending edit points in the appropriate dialog box. This is an option if you have a computer-based system. If you have a keyboard and you’re a fast typist, this may be the most efficient way for you to choose edit points. On most systems, you can zoom in or out on the waveform graphic for a better look. You can often increase both the height (amplitude) and width (time frame) of the image of the waveform that you see. With most instruments that have slow attacks — a slow initial sound, as with vocals or guitars — you can see the start of the sound by looking at the waveform. The beginning in the rise of the waves matches the beginning of the sound. But on drums and other instruments with very fast attacks, the attack of the instrument happens before the rise in amplitude. If you were to rely only on your eyes and choose the waveform part that you see, you would miss the initial point of the stick hitting the drum (and all the character that it contains). What you would hear is a mushy-sounding snare drum. Many computer-based programs have a function that allows you to find the start point of your audio with a simple keystroke. In Pro Tools, this is called Tab to Transient. In this case, all you need to do is enable this function, move your cursor to a point just before the section you want to find, and press Tab. The cursor moves to the beginning of the audio data. This feature is handy for making edits quickly and accurately. If this type of function is important to you, be sure to look closely at the computer program before buying to see whether it can do this.